These Commonwealth Weathermate Insulated Grommet Top Panels are 100% cotton duck cloth fabric with an insulating foam backing. The insulated foam backing helps to stop the heating effects of the sun or the cold drafts through windows. These Panels feature 12 antique metal grommets per pair. 24 Grommets for Patio Pairs. ** The first picture shows the actual curtain style, the rest show the colors they are available in. 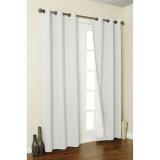 Curtains are 80" wide to the pair and have 12 Grommets to the pair.